The CR-2020 is a fantastic mix of everything you want in a big, powerful receiver. Fully functional and tested. Will show signs of wear due to previous handling. Nothing else will be included. Item Features. New ListingAUDIO CABINET, FISHER, SCOTT, PIONEER ETC... VERY NICE CONDITION, FREE SHIPPING! AUDIO CABINET, FISHER, SCOTT, PIONEER ETC. VERY NICE CONDITION. NOT SURE OF MANUFACTURER OR WHAT IT MAY FIT. Depend on Pioneer to provide the latest electronic advances and the SX-838 stereo receiver is a perfect example. For the FM MPX demodulator, Pioneer uses a new PLL (Phase Lock Loop) circuit with an IC. For sale is a Marantz 2220B receiver. This unit plays like new and sounds like new. If you are not familiar with Marantz then you will be very surprised at the performance. If you are familiar with Marantz then you are looking at this so there will be no need to do anything to it. SANSUI Stereo Receiver SIx. Good Looking and Working Condition.. Shipped Fedex Ground/Home or USPS (if Intermational). Vintage Kenwood KR-V107R 2 Channel 100W Receiver-W/ Original Remote-Works Grt! Up for your consideration is a Vintage Kenwood KR-V107R 2 channel 100W stereo receiver. Hard to find unit. Unit has been tested and works as it should. Comes with original remote and AUX cable for hooking up your other Kenwood components. Condition is great nothing broken or damaged and has been cleaned. 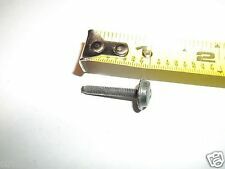 I will package your item with utmost respect so it gets to your door safe and fast. What you see in the pics is what you will receive. Please message me with any questions you might have. Buy with confidence! Thxs! Free Expedited Shipping to the lower 48! RETURNS ARE ACCEPTED ONLY IF THE ITEM IS NOT AS DESCRIBED IN THE LISTING! Thanks! NO PO Boxes Please!! Fast N Free!! This is a 35 watts per channel receiver that I found at Goodwill and was surprised how good it looked, so took a chance on it. Everything worked! I went through and replaced all the electrolytic capacitors. Here’s a clean Model 620 from Yamaha.the specs I thoroughly cleaned this machine inside and out. cleaned the pots and switches. and sound/functions tested this for at least an hour this morning. Bang & Olufsen amp/receiver BEOLAB 5000. It works good. Tested both sides and both speaker channels. It is playing as I list it. It has one nick on the edge otherwise in very good condition.I tested the tape and turntable. NO NOISE DURING POWER UP OR DOWN. VINTAGE PIONEER SX-680 STEREO RECIEVER - 30 watts per channel Condition: Unit works well, including all lights and meters. Has scratches, some veneer peeling, and a number etched out on the top (see red pencil in photos). From my personal collection. Used, but in Good condition. TESTED, and in perfect working order. NO REMOTE included. The only issue is the light that illuminates the FM source is out so it does not cone on. The FM tuner still works as intended just does night light up when on like the other sources do. Marantz 2215 AM/FM stereo receiver. When they are in the right location you have equal output to both sides. The woodgrain cover had no dents or gouges. All inputs tested and working. Marantz 1090 Serviced By NW Audio in 2018. Part of my personal collection, has not been used since service. All the pots and switches were also deoxed so its plug and play ready. The tuner gets good reception with a small wire for antenna and all the inputs work as they should. It has A/B/C speaker switching so itll power 3 sets of speakers. For Sale is a very nice Marantz 1530. Item has been fully serviced, tested, and LED upgraded light display. Classic silver stainless steel look & Made in Japan. Item has been properly serviced, cleaned and works great. MCS 3235 stereo receiver. This model is one of the best looking receivers made and sounds good too. 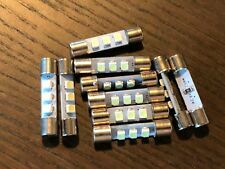 Rated at 35 watts per channel 8 ohm. replaced all 4 light bulbs. cleaned; including removing lens and cleaning behind it. Great looking and sounding Tandberg TR-2025 AM/FM Stereo Receiver in good shape for its age. It has 5 tuner presets and is rated 40 watts per channel at 4 ohms/25 at 8. It was recently treated with deoxit so its plug and play ready. Powers on, works good, NEEDS A 3.3A fuse. Has 1 of 2 fuses, switched it back and forth to test it. See photos. All lights work. 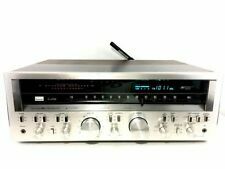 Vintage Pioneer SX-780 Stereo Receiver w/ LED Upgraded Dial Lamps -----> Cool!!! Works as it should and sounds great. All inputs have been tested. Beautiful Sansui QR-4500 4 Channel Quad / Stereo Receiver - Good Condition! Powers on, Lights work great, All Knobs and inputs are intact and function. Ive tested the AM and FM Tuners. 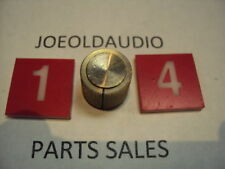 Face plate and knobs are in great condition, No fading or scratches. Light scratches on wood cabinet, See Photos for details. PIONEER SX-650 VINTAGE STEREO RECEIVER - SERVICED - CLEANED - TESTED LED Lights. Shipped with USPS Parcel Select Ground. Awesome sound! 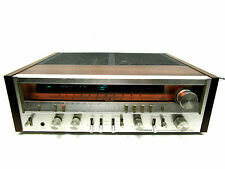 Rare 1980-1982 Sansui 8900ZDB - The last of the big Sansui Receivers. I call this more of a Retro Receiver! FM tuner adjusted. Receiver only, you don't get the pile of old electronic components that were replaced in the last picture. This is in good used condition and has been tested and working. Unit appears to be working great. See pictures for condition details. I tested it; it sounds great. I tested the phono inputs (it has two) and the speaker outputs (it has three), all work well. I tested FM and AM radio and aux input, all are good. The lights work, as you can see in the photos. The amplifier looks quite good for its age. The top and bottom covers had been repainted. The face plate has scratches and dents, chassis had rust spots that was cleaned off, all conditions appropriate to its age. Up for auction is a Kyocera A-710 Amplifier. It's in good condition, showing some wear. 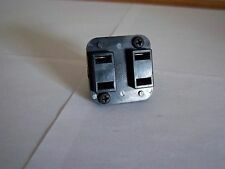 The power switch is not mounted down like it should be, and it moves around sometimes when trying to push it, the actual power switch works fine it's just needs to be remounted inside the unit, it must have gotten knocked loose at some point. It sounds great. Thanks and good luck. Vintage stereo receivers are designed with practical knobs and buttons that adjust sound volume and frequencies. Many units have a wooden housing with metal components, and some gadgets are completely constructed out of sleek aluminum material. Vintage stereo equipment is easy to use because all volume, bass, and treble components are strategically placed on the main panel. What are typical vintage stereo receiver specs? A general stereo receiver has audio hardware that relies on channels. Most gadgets will have four channels or higher. Vintage stereo equipment may also have an LCD display that provides information about AM and FM radio frequencies. When needed, you could play songs multiple ways while using a receiver if it has a UBS port and a slot for SD memory cards. Some vintage stereos are also designed with hardware that supports aux inputs and spots for RCA input jacks as well. Featured refinements: Options include Pioneer SX and Technics SA. Brand: Various brands make these receivers. You can choose Fisher, Kenwood, Marantz, Pioneer, Realistic, Sansui, Technics, and Yamaha. What are the design specs for the frequency tools? Stereo/mono options: A typical panel has a switch that gives audio a stereo or mono effect. 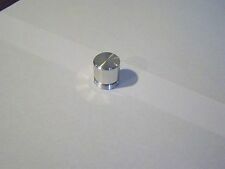 Phono buttons: The gadget has convenient phono buttons. Volume: The unit has multiple volume settings. Audio frequency: The unit has audio frequency modes for treble. What are the design specs for high-frequency stereos? High-frequency stereo receivers are built with FM and MW (medium wave) tuning range hardware. These units have a practical power output capability because the electrical components can effectively process 100 watts per channel. The frequency range for a general device is efficient because the hardware can handle 10 hertz to 40 kilohertz. When this product generates loud, bold effects, the frequency technology distributes crisp, vibrant waves throughout a space since the main hardware has a total harmonic distortion of 0.1%. Most high-frequency products are also built with other features that can enhance sounds, such as a photo equalizer and heavy-duty components that are designed for intense bass and treble notes. How can quad technology enhance sounds? Quad technology provides bolder sounds because the hardware relies on four speakers. When all four speakers produce sounds in the space, the multiple waves intensify the effects.